A church has been on this site in Ripon, England since 672 AD. 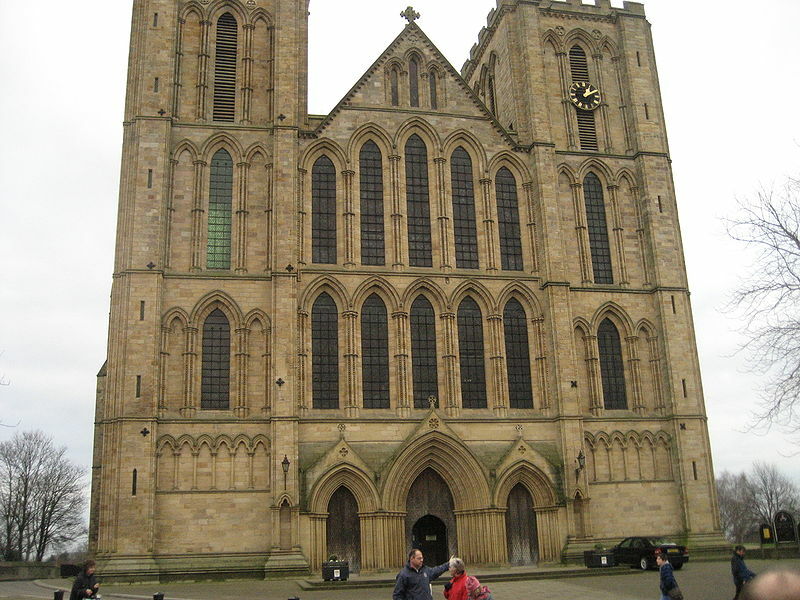 Ripon Cathedral was founded by Saint Wilfrid who was born c. 634 and died in 709 AD. Wilfrid was born into an aristocratic Northumbrian family and joined the monastery of Lindisfarne when he was a teenager. He was to make three trips to Rome. On his last trip home, he stopped and stayed with the Bishop of Lyons in France for three years and became immersed in the traditions and customs of the continental church. When he returned to Northumbria in 658, he was made the Abbot of the recently founded monastery of Ripon. He began building a stone church on the site. Wilfrid brought stonemasons, plasterers and glaziers from France and Italy to work on his basilica. The crypt of the present church is the only part of the original building to survive intact. It incorporates stone that appears to have been salvaged from nearby Roman ruins and reveals building methods that were essentially unknown in England at that time but which Wilfrid would have come across in his travels on the continent. Saint Wilfrid was buried near the high altar of this church. Wilfrid’s original church was ravaged in warfare in 948. A second minster soon was built but it was destroyed in 1069 at the hands of William the Conqueror. The first Norman Archbishop of York, Thomas of Bayeux began construction of a third church. Much of what is seen in the church today dates from this time. The early English west front was added in 1220 and the two towers originally had spires made of wood covered in lead. The nave was mostly rebuilt in the Perpendicular or late Gothic style after the central tower collapsed in 1450. During the Wars of the Roses, construction came to a stop. After King Henry VII ascended the throne in 1485, the nave was widened and the central tower partially rebuilt. During the Reformation of the 1530’s construction was disrupted. In 1547, under King Edward VI, before all the reconstruction was finished, the college of canons was dissolved and all revenues were appropriated by the crown. To this day there are incomplete pillars and mismatched arches under the central tower. It was not until 1604 that King James I issued his Charter of Restoration and it was once again a collegiate church. The charter was to be revoked again under the Commonwealth of Oliver Cromwell. King Charles II restored the charter after the restoration of the monarchy in 1660. The minster became the focal point of the newly created Anglican Diocese of Ripon in 1836, the first to be established since the Reformation, and was made a Cathedral. Ripon Cathedral is currently the seat of the Bishop of Ripon and Leeds. 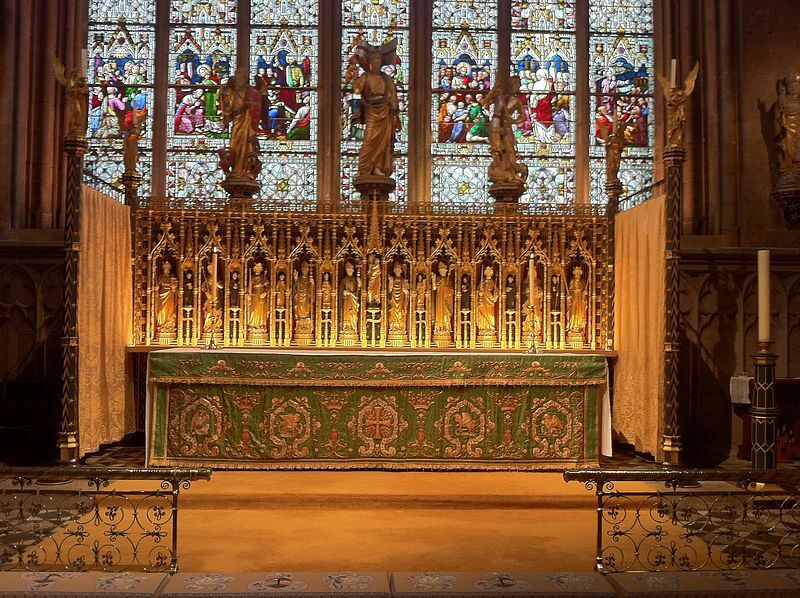 The interior of the Ripon Cathedral is a piece of art – so magnificent! I’m glad to see Ripon Minster featured. Regrettably its library is no longer in-situ but was whisked away some Years ago. The sooner it is returned [and other rash innovations of the CofE reversed] the better. Didn’t know about the libarary Peter. That is a shame.